Rob McLoughlin, ITV‘s longest-serving presenter of political programmes, will step down from ITV Granada’s political series Party People in December. McLoughlin began his TV career on Granada Reports in 1982 and first presented the programme, aged 24, in 1983. 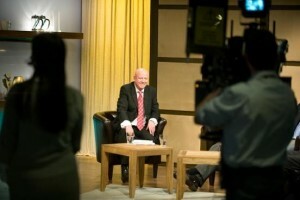 He hosted his first political series (Granada on Sunday) for the channel in May 1994, launching with a tribute to the former Labour Leader John Smith. He went on to present local and general election specials as well as The Spin and later The Line and The Sunday Supplement. He said: "It has been a tremendous general election year for Party People, opening in January and February with big in-depth interviews with David Cameron, Ed Miliband, later with George Osborne, Nigel Farage and then that Derek Hatton interview which was really a preface to the dramatic changes which Labour are now facing." He described John Prescott as one of the most challenging people to interview, but singled out Sir John Major as the one PM who "always attempted to answer a straight question with a straight answer". McLoughlin also worked extensively for ITN and ‘World in Action’ before he became a board director to Granada Television in 1996 and later an advisor for a decade after he established his own media companies including Hasgrove plc, which owned the digital marketing agency, AMAZE, and Interel SA across Europe. He added: "I want to focus on some new and exciting media projects for the first part of 2016 including the successful Educate – North Awards and Conference with the national newspaper group The Telegraph and Prolific North which we created last year and which focuses on the planned Northern Powerhouse and higher education sector and a new project, yet to be unveiled, in sport. "However, I will be back on the political and current affairs beat shortly, it's in the blood and as Tony Wilson always stated there is nothing quite like live or as for live TV." ITV has yet to confirm a replacement for McLoughlin.